This image comes one week before yesterday's and a dawn outing on State Street. The forecast for light clouds raised my hopes for a good sunrise and I set my alarm clock to try to take advantage of the conditions. I started off on State Street in the pre-dawn blue hour and found one house with holiday lights encircling the door. I moved to the edge of the sidewalk for this image of the street winding toward the harbor and the shining star hanging overhead from a crane. 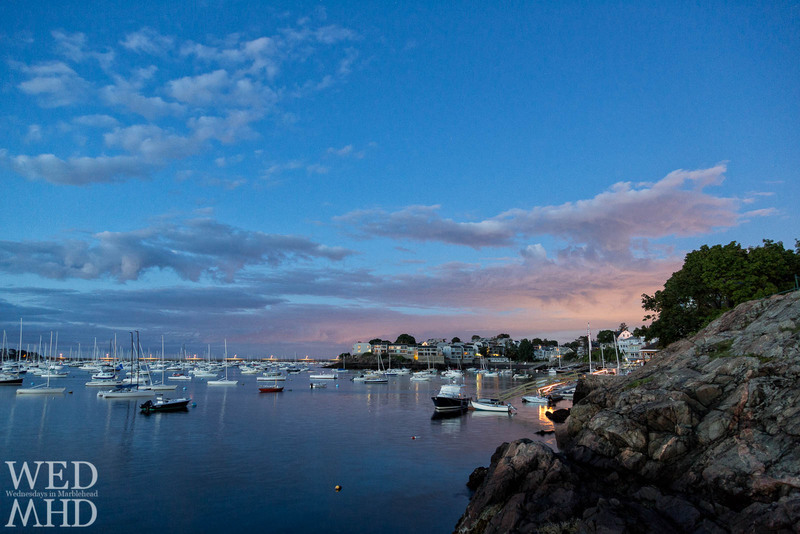 In early September, I had woken up early enough to capture Marblehead harbor in the blue hour. I drove down State Street to Front Street and parked at the Landing from where I walked around the corner and found this vantage point. The waters were incredibly still and, for some reason, all of the lights were on at the Corinthian Yacht Club at 5:45am when I clicked the shutter. The golden glow of those lights complemented the blues in the sky and water with the bright green light of Marblehead Light reflecting in the still waters. This image comes from the morning of February 6 and followed the image of the tree at Fort Sewall. When I composed that wider shot to include the snow covered branches of the tree, I had noticed the bright lights of the causeway shining at regular intervals. I decided to reposition the camera near the edge of the walkway at the fort and zoom in to highlight the alternating lights against the clouds and sky in the blue hour of dawn.